The Stuarts and the Union Jack. Last night I watched part one of a new three part series entitled The Stuarts. In part one, Cambridge University's Dr Clare Jackson argues that the Stuarts are "more than any other, Britain's defining royal family." Dr Jackson, standing in the Great Hall of Stirling Castle, spoke of James I's family tree, staring in wonderment at its ceiling bosses which colourfully depicts the blood line of the Stuart dynasty which date back to 1371, pointing out that Henry VIII's images is sidelined beginning and ending in three generations. The main focus of Dr Jackson's presentation however, was the union of Scotland and England and how later, James I paved the way for the Act of Union between the two nations. Aired ahead of a referendum on Scotland's independence this episode did make me think again on this subject. Dr Jackson spoke of Kings James I commissioning different designs for a new union flag, it was at this point I thought that if independence goes ahead what will then happen to our most famous icon, the one that proudly flies over every castle, the one we all wave enthusiastically on grand occasions, the Union Jack. 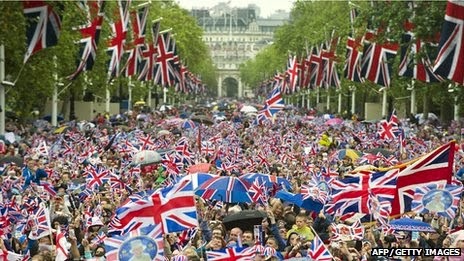 Surely it will have to go, for no longer will we be a United Kingdom, and what a sad day for all that will be! It is very easy to view the medieval, battle weary knight, riding into the distance on his worn out steed, scarred and blooded in a romantic light isn't it? We visualise our armoured hero, victorious, living to fight another day. At Towton, on the 29th March 1461, it is said that 28,000 men lost their lives at the Battle of Towton, this should shock us but it doesn't really, does it? When I think of this, I am guilty of visualising the smokey, body strewn, blood soaked battlefield scene of Kenneth Branagh's Henry V. With images like that it is very hard for us to really know the extent of these poor mens injuries. We now have evidence of the wounds the medieval man inflected on one another and I would like to feature, the man who is now known as Towton 25, story again. This soldier had survived battle before. A closer look at his wounds revealed. "A healed skull fracture points to previous engagements. He was old enough—somewhere between 36 and 45 when he died—to have gained plenty of experience of fighting. But on March 29th 1461, his luck ran out. 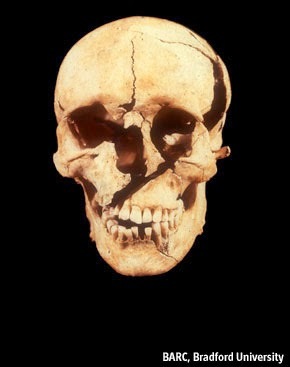 Towton 25 suffered eight wounds to his head that day. The precise order can be worked out from the direction of fractures on his skull: when bone breaks, the cracks veer towards existing areas of weakness. The first five blows were delivered by a bladed weapon to the left-hand side of his head, presumably by a right-handed opponent standing in front of him. None is likely to have been lethal.The next one almost certainly was. From behind him someone swung a blade towards his skull, carving a down-to-up trajectory through the air. The blow opened a huge horizontal gash into the back of his head—picture a slit you could post an envelope through. Fractures raced down to the base of his skull and around the sides of his head. Fragments of bone were forced in to Towton 25's brain, felling him. His enemies were not done yet. Another small blow to the right and back of the head may have been enough to turn him over onto his back. Finally another blade arced towards him. This one bisected his face, opening a crevice that ran from his left eye to his right jaw. It cut deep: the edge of the blade reached to the back of his throat." What I am getting round to is sometimes we need to realise just how horrific medieval warfare was without looking through our rose coloured glasses. 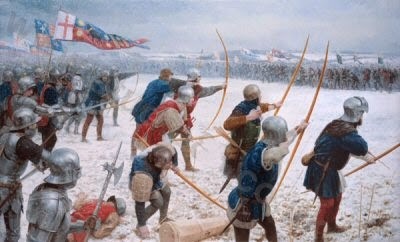 In the link attached, Christopher Maudsley helps with this, featuring a reconstructed image of Towton 25. It makes me want to cry! Magna Carta means simply ‘big charter’. A charter is a legal document issued by the king or queen which guarantees certain rights. This charter has over 60 clauses, covering many areas of the nation’s life, including the right to a fair trial. It is one of several copies written immediately after King John agreed peace terms with his barons at Runnymede, which were sent around the country as evidence of the king’s decision. Salisbury Cathedral’s copy is one of four which survive from this original issue. It was written in Latin by hand, by an expert scribe, on vellum (preserved animal skin). Medieval documents like this were not signed, but sealed, and at the bottom of our Magna Carta you can see the marks where King John’s seal used to hang. 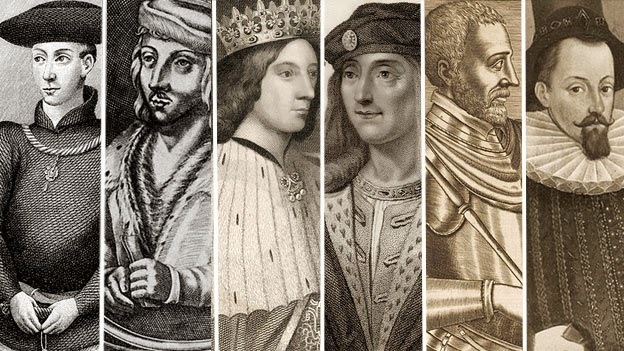 Magna Carta is famous as a symbol of justice, fairness, and human rights. For centuries it has inspired and encouraged movements for freedom and constitutional government in Britain and around the world. But when it was issued by England’s King John in June 1215 it was an attempt to prevent a civil war between the king and his powerful barons. When this document returns, we here in Lincolnshire have great plans for it. My first image shows work in progress, and the second image shows a artist impression of the Magna Carta Vault will look like once completed. Magna Carta Vault has been designed by renowned architects, Arrol & Snell who have gained a reputation for high quality conservation work as well as for sensitive new-building designs in historic locations. 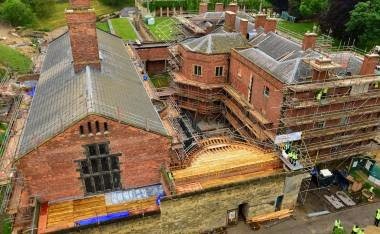 The company designed the award winning Heritage Skills Centre at Lincoln Castle, which opened to critical acclaim in February 2013. As the first new building within the Castle for 150 years it was designed to be well-integrated into its historic setting. Visitors will begin their journey to see Magna Carta by approaching the Pavilion entrance along a dedicated causeway, taking them over the Eastern Courtyard of the Victorian Prison. Once through the entrance the Great Charter Wall will come into sight. This striking feature wall will carry the text of Magna Carta with key Clauses defined in gold lettering, and the exhibition space will be enriched by graphic and colourful text, including the heraldic achievements of the Barons. Magna Carta in the Round, an immersive audio visual interpretation will tell of the impact and influence of Magna Carta over 800 years. It will link Magna Carta and Charter of the Forest to the wider Castle site, with its Court House and Prisons through three themes: accountability, justice and power. Visitors will be surrounded by the story of Magna Carta depicted through a series of newly commissioned short films shown on large scale wrap-around screens. Then visitors will arrive at the Vault room, a dedicated purpose built space to house Magna Carta. Here, in environmentally controlled conditions, visitors will be able to view three historically significant documents – Magna Carta itself, one of the two surviving copies of Charter of the Forest (1217), and a third document loaned from national or local archives. 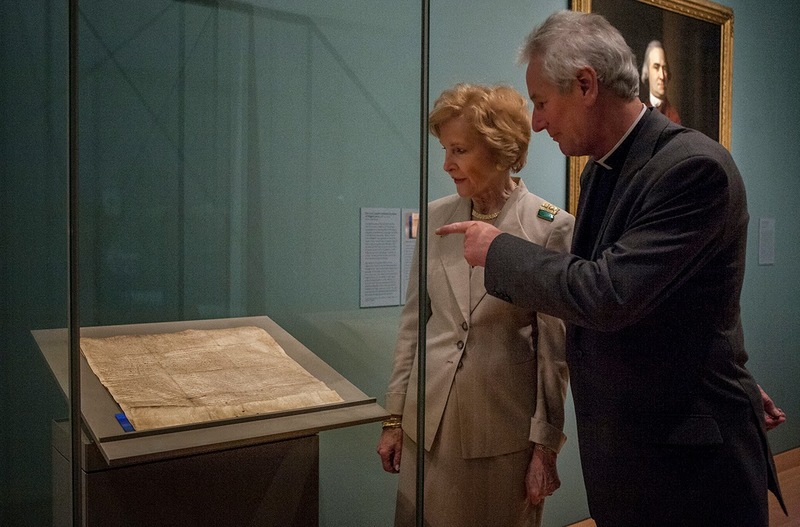 During 2015, when the 800th anniversary of the sealing of Magna Carta will be celebrated in Lincoln, a 1225 Magna Carta on loan from the National Archives will be displayed. As part of the 800th anniversary a celebratory programme of events is being planned in Lincoln. The Historic Lincoln Trust is working with partners on two key events – firstly, to devise and co-ordinate Lincolnshire’s Great Exhibition which will display a nationally important collection of pictures, documents and artefacts with a Lincolnshire connection; and secondly, a Three Choirs Festival involving Cathedral Choirs of Lincoln, Peterborough and Southwell. Lincolnshire’s Great Exhibition will be based in the Usher Gallery and the Collection, as well as in the Medieval and Wren Libraries in the Cathedral, and in the Castle. The exhibition in the Collection will be focused on great Lincolnshire figures from Gilbert of Sempringham, who founded the only English monastic order in Lincolnshire in the 12th century, to Margaret Thatcher, our Country’s only female Prime Minster and the longest serving Prime Minister of democratic times. There will be items on loan from the British Library, the Victoria and Albert Museum, the National Portrait Gallery, and many other important public and private collections, with a special section of the exhibition devoted to treasures, many of them largely unknown, in Lincolnshire private collections.